Babel Buster 4 - The Next Generation! The new Babel Buster® 4 is a performance enhanced multi-protocol network gateway designed to serve many network gateway needs in a single package. The BB4-8422 includes dual Ethernet ports, dual isolated RS-485 ports, and USB flash drive port for external file transfer. This new generation gateway features a faster processor, greatly increased memory capacity, and network security support. The user may assign any supported protocol to any port. The Babel Buster 4 brings together all of the best features of our most popular Babel Buster 2 family gateways plus everything else you asked for along the way. By incorporating a full implementation of Linux, we leave the door wide open to adaptation to an endless array of protocols, applications, and features. Plus, programmers with PHP and Json experience can turn the user interface into anything they like. 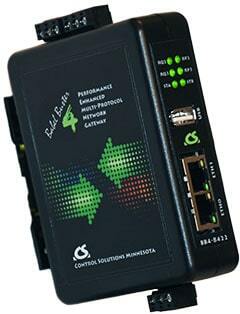 Protocol support in initial release includes Modbus and SNMPv3, with BACnet soon to follow. There is only one model - you just keep adding protocols as they become available. There is no added charge for adding an open protocol. Subscribe to our mailing list to stay informed on release dates and ordering information. 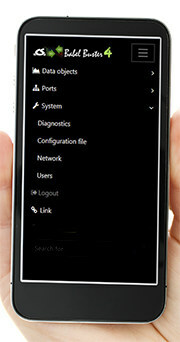 The web pages served by the internal web server have been overhauled to be mobile responsive and dynamically updated. That means you can easily view data and configuration from your smart phone if you have made the Babel Buster accessible via secure Internet connection.